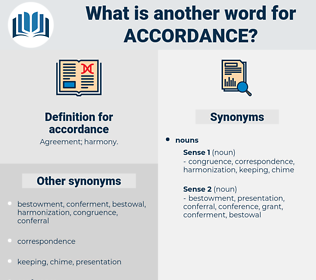 What is another word for accordance? commensurate, compatible, under, convergence, following. purposes, Veterans, Children, accord, accords. 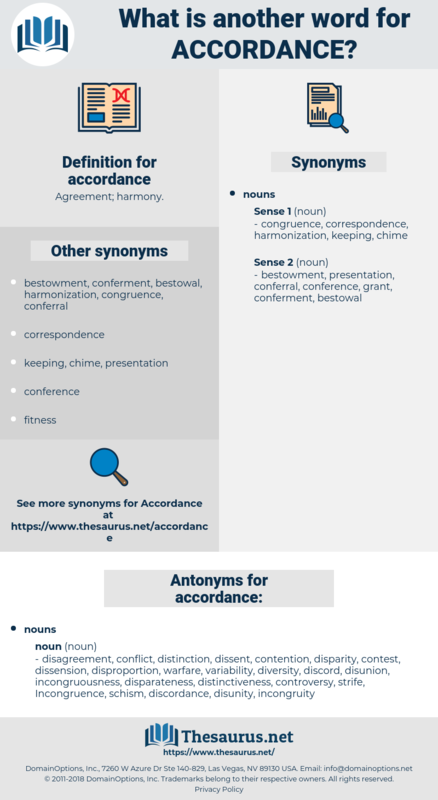 Bis, harmony, observance, coherence, correspondence, concurrence, context, furtherance, light, accord, connection, commensurate, compatible, reference, consequence, consideration, manner, convergence, spirit, function, acquiescence, principle, principles, concert, responsiveness, conjunction, purpose, account, direction, service, assent, following, unison. Conformed, honoured, Delivered, fulfilled, Convened, conducted, Provided, Stood, organized, Met, extended, maintained, found, kept, Took, Wished, hosted, paid, held, wanted. harmonized, governed, confirmed, mandated, recognized, guided, derived, Enshrined, outlined, specified, authorized, Provided, aligned, imposed, spelled, laid, called, stated. disagreement, conflict, distinction, dissent, contention, disparity, contest, dissension, disproportion, warfare, variability, diversity, discord, disunion, incongruousness, disparateness, distinctiveness, controversy, strife, Incongruence, schism, discordance, disunity, incongruity, discrepancy, inconsistency, friction, dissidence, variance, separation, diverseness, battle, deviance, difference, opposition, hostility, unlikeness, dissimilarity, divergence, distinctness, incompatibility, antagonism, contrast. There was not absolutely any quarrel between them, but on this terrible subject there was an utter want of accordance, and almost of sympathy. Whatever steps of real reformation have been taken of late, have been in accordance with some of these. acridness, asserting, assuredness, awkwardness, according.